Workers Pledge in Time of War. I refuse to kill any child’s father. I refuse to slay any mother’s son. woman’s brother, lover, or mate. I refuse to murder and deem the slaughter glory. stained fists in the folds of a bloodstained flag. to serve, I decline to kill. Discussion 6.30-8.30. Social 8-30 onwards. Author of ‘Rebel Alliances: The Means and Ends of Contemporary British Anarchisms’ (2006), Benjamin Franks will be present to discuss his recent work, ‘Between Anarchism and Marxism: the beginnings and ends of the schism’ (2012), followed by a group discussion. “The standard approach, endorsed by orthodox Marxists and many anarchists, is to see an irreconcilable difference between anarchism and Marxism. 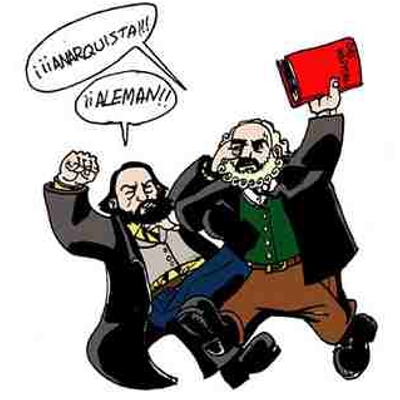 However, the historical record shows that whilst Marx opposed – and was opposed by – leading anarchists prior to 1917 there was considerable positive interaction between diverse Marxist and anarchist groups. The division between the two, viewed as fundamental, I argue, is in fact the product of a particular form of political structure that dominated the revolutionary-left in the last century. Now that these hierarchical forms of organisation have been discredited, rediscovered and revised forms of Marxism have arisen that, once again, actively engage with anarchism”. Refreshments available though feel free to BYOB! Hosted by Glasgow Anarchist Federation, Clydeside IWW, Radical Independent Bookfair, and The Strickland Distribution.